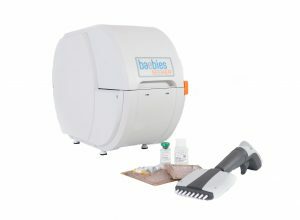 Baebies, guided by the vision that everyone deserves a healthy start, delivers innovative products and services for newborn screening and pediatric testing. SEEKER® is the only newborn screening platform authorized by the U.S. FDA for lysosomal storage diseases. Still under development, FINDER is a rapid near-patient newborn testing solution. FINDER is not available at this time for sale or use in any territory. DURHAM, N.C., February 3, 2017 – Baebies, Inc., a company focused on advancing newborn screening and pediatric testing, announced today it has received de novo clearance from the U.S. Food and Drug Administration (FDA) for SEEKER. SEEKER quantitatively measures the activity of lysosomal enzymes α-L-iduronidase (IDUA), α-D-glucosidase (GAA), β-glucocerebrosidase (GBA) and α-D-galactosidase A (GLA) from newborn dried blood spot specimens. Reduced activity of these enzymes may be indicative of lysosomal storage diseases (LSDs) Mucopolysaccharidosis Type I (MPS I), Pompe, Gaucher or Fabry, respectively. SEEKER IS DESIGNED FOR EASE OF USE, MINIMAL MAINTENANCE AND FLEXIBLE FUTURE EXPANSION. Newborn screening, widely recognized as one of the most successful public health programs in the U.S., ensures that all babies are screened for certain serious conditions at birth. The program started more than 50 years ago and has since expanded to include more than 30 metabolic and genetic diseases. The recent addition of Pompe disease and MPS I to the Recommended Uniform Screening Panel (RUSP) have brought more recognition to the benefit of early detection through newborn screening for LSDs. “As LSDs are being added to the RUSP, state newborn screening programs are making plans to begin screening. FDA clearance enables state laboratories to confidently implement testing while minimizing the validation effort resulting in a cost effective implementation,” said Bradford Therrell, Jr., PhD, the Director of the National Newborn Screening and Global Resource Center. FINDER is the only platform specifically designed to address the unique needs of neonatal testing. FINDER substantially decreases both sample size and testing time, enables testing in the nursery or anywhere in the hospital, and delivers comprehensive test panels – even across multiple test types – to solve acute problems in neonatology. Simple operations and test flexibility enable FINDER to provide results in minutes. SEEKER® is the only newborn screening platform authorized by the U.S. FDA for lysosomal storage diseases. SEEKER is a high throughput laboratory solution that quantitatively measures the activity of lysosomal enzymes from newborn dried blood spot specimens. Reduced activity of these enzymes may be indicative of Mucopolysaccharidosis Type I (MPS I), Pompe, Gaucher or Fabry disease.